We awoke in Strasbourg, then headed to Offenburg. From Offenburg, we traveled to Karlsruhe and from there, on to Munich. And you know what that means.... next stop: Salzburg. 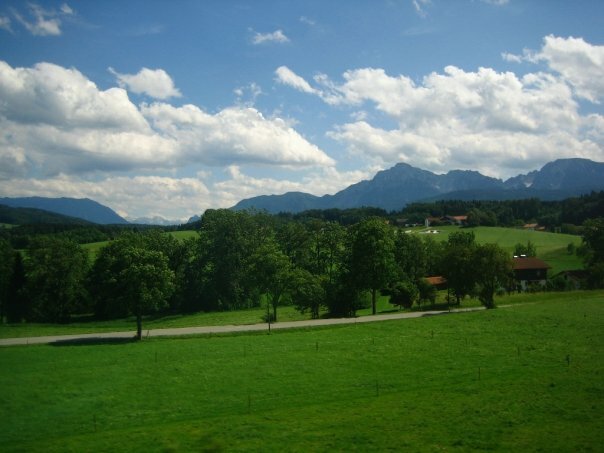 The train ride from Munich to Salzburg is so familiar to me; I've begun to know it like the back of my hand. Mostly because taking the Bayern ticket from Salzburg to Munich (and back again) is one of my favorite ways to travel here. You pay 20 euro for a single ticket and 25 euro for a group ticket (up to five people) and that allows you to travel anywhere in the entire state of Bavaria (Salzburg included) for the day (so long as you are traveling on Regio-Bahns and not ICE trains) (and so long as you leave after 9:00 AM -- can't forget that one). As you can imagine, my friends and used this quite a bit over the past few months. And that is, precisely, how I know the route frontwards and backwards, in my sleep and wide awake: Salzburg, Freilassing, Teisendorf, Traunstein, Prien am Chiemsee, Bad Endorf, Rosenheim, Großkarolinenfeld....and onto Munich it goes. 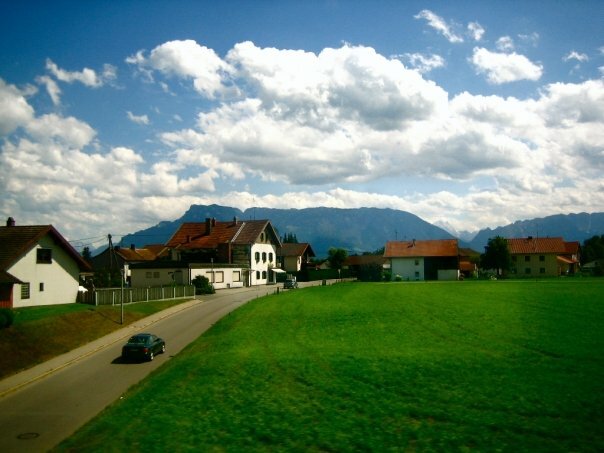 As we were nearing Salzburg, not only did we look worn-out, but we should have felt completely exhausted. In reality, we were thrilled beyond words to be approaching our destination at last. And what a destination it was: my home! I love living in Salzburg, of course, but I might love introducing people to Salzburg even more. Our school's cultural guide, Andreas, cites "sharing his beautiful homeland with visitors" as his passion in life, and I'm beginning to understand how he feels. No matter how long I've been in Salzburg, I still get butterflies every time come back again after having been away for a few days. In between Freilassing and Salzburg, the butterfly-feeling reaches its peak; so close, almost there! By the time we took the bus into the city center, I was beaming with pride. 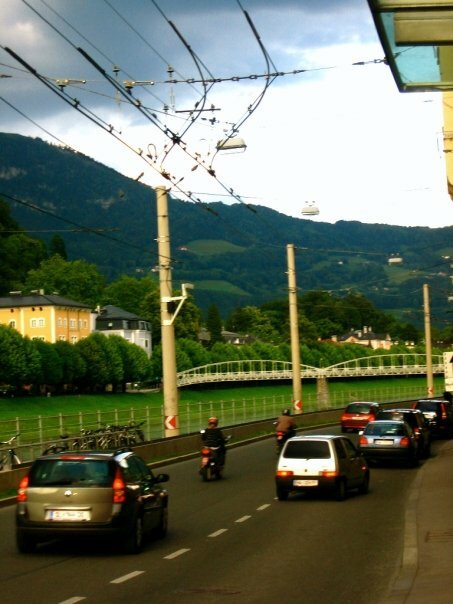 Jenny was so excited for me to show her around, and while I appreciated her enthusiasm, I think that even if she had been totally apathetic and indifferent towards Salzburg, I still would have made my love for the city so known that it eventually would have rubbed off on her. Luckily for me, I didn't have to resort to that, because she loved it from the get-go! We stepped off at Mozartsteg and changed busses there to get home to my place. After we dropped off our bags in my room and unpacked, we were off again -- no time to waste. We stopped to eat lunch at Indigo, one of my favorite restaurants, which is just down the street from my place, within walking distance. 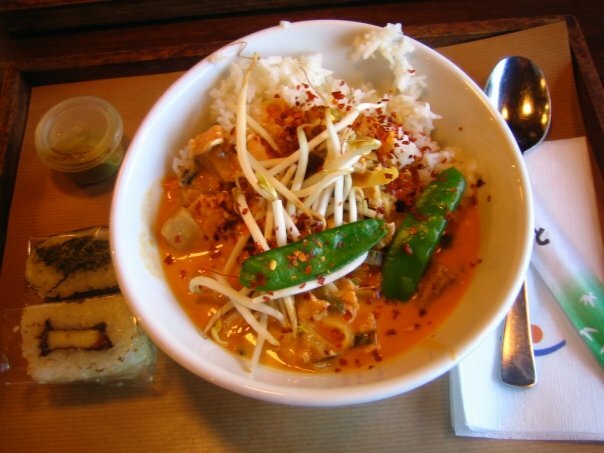 I love their sushi and curry and it's inexpensive which is, of course, my favorite quality in a restaurant. You add the spice yourself -- no numerical or star scale to worry about -- and the sushi is sold individually so you can try lots of different kinds without committing to a whole tray (primetime firstworldproblems, huh?). And each roll costs only a euro or two, so you can dine here for under 10 euro if you wish (but always remember to bring your own water, as buying water bottles can add up at two euro a piece!). It's amazing how quickly your trip can turn around. Just last night we were stuck in the south of France without a clue as to how we'd get out. Less than twenty-four hours later, we were sitting at Indigo without a care in the world. Except we were a little concerned that there just weren't enough hours in the day to do what we had to do, and see what we had to see. But that's nothing new. That's just the double-edged sword of life in Salzburg. 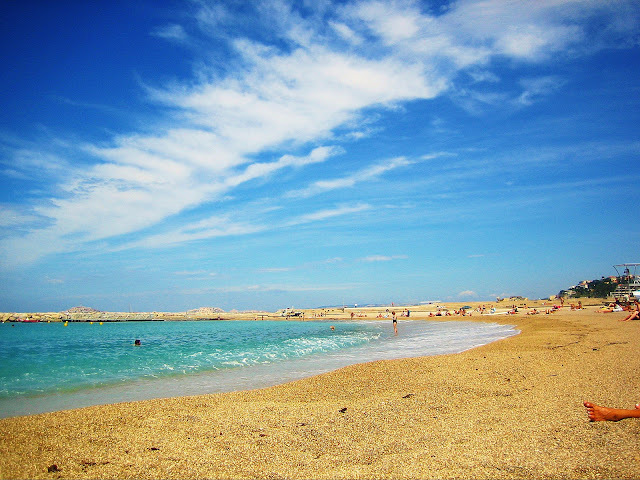 A trip to the beach in Marseille...goes very, very wrong. We landed in Marseille a little before midnight, happy to have escaped the London Tube strike drama. 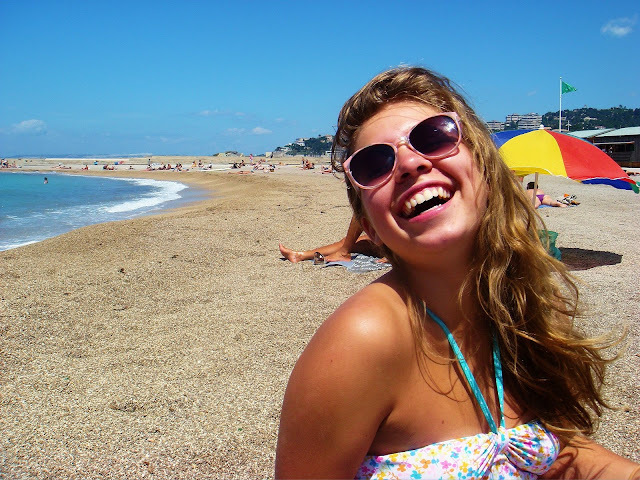 Marseille was just a glorified stop-over; it wasn't in our initial itinerary but once we found a super cheap flight out of London, we decided to spend one night there and lay at the beach the next day, before taking an overnight train and making our way to Salzburg. 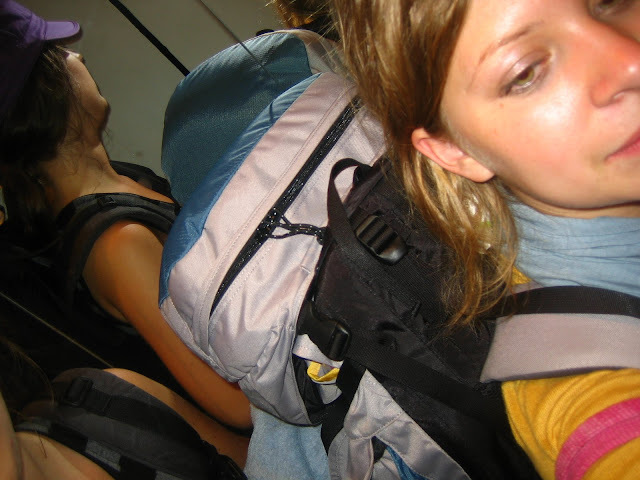 Once we took a shuttle from the airport to the hotel, we were faced with the first of many challenges: fitting both ourselves and our backpacks into the elevator. We awoke in the morning and headed to the beach! Our bus took us from the hotel straight to the beach and was 30 minute ride with a beautiful oceanside view. On the walk from the bus stop to the beach, we stopped for a snack: a tomato, basil, and mozzarella panini. We are still talking about how good that 'snack' was and ate it so quickly that we don't even have a picture to show for it. We stayed at the beach for 4-5 hours, during which time we became unbelievably hungry and thirsty (I know, I know, we should have seen it coming). Not only were there over 100 steps, but the heat was unbearable and our backpacks were awfully heavy. Unfortunately, by the time we made it inside and to the platform, our train had left. We had just missed it. It was frustrating to realize that a few extra minutes at the grocery store (which caused us to miss the bus) had ultimately cost us our night train. So we sat at the Marseille train station and evaluated our options. As we sat, I decided to eat some raisin bread that I had bought from the grocery store's bakery (during the now-infamous never-ending grocery store trip). As I swallowed the first few bites, I said to Jenny, "This tastes terrible." A few more bites later, "No, really -- this is not good. I used to buy this bread in Salzburg all the time and loved it. I don't know why this is so different." That's when I discovered that the loaf of bread was packaged and sold on a thin layer of paper, and that I had been eating the paper along with the bread. As Kayla would say, "Low point." Realizing I had swallowed several bites' worth of paper seemed pretty fitting for the day as it had apparently taken a turn for the worse. As we weighed our options, we realized that Jenny and I (especially Jenny) were pretty sunburned. 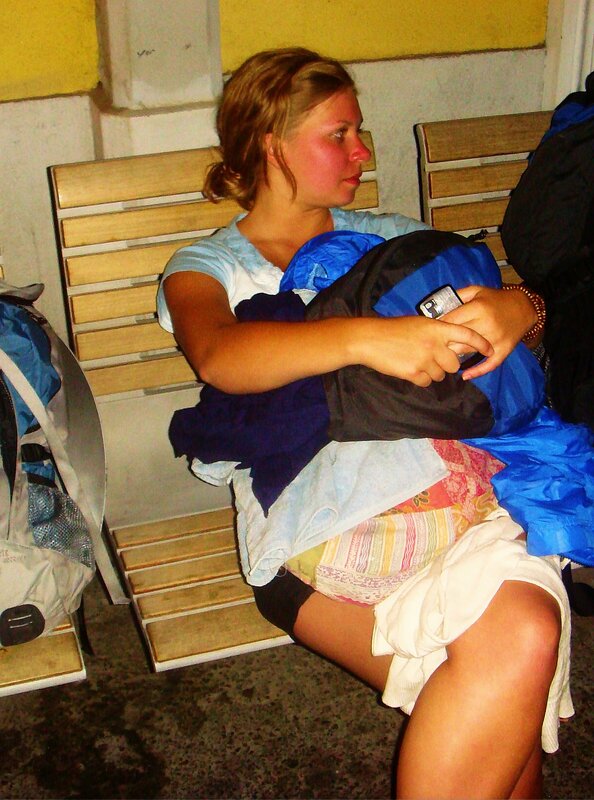 Jenny's face looked like a lobster and my shoulders, now bright red and tender, were bearing the weight of an awfully heavy backpack. We temporarily compartmentalized our pain, however, as we deliberated each of our three options: (1) We could stay another night in Marseille at the hotel and leave in the morning. In hindsight, this was the most logical of options, but I did not want to pay for another hotel room and I also did not want to delay our arrival in Salzburg another day. (2) We could take trains as far east as possible and see how far we can get before they stop running for the night. With that option, however, we ran the risk of getting stuck sleeping overnight on a bench outside of a train station, which obviously wasn't very appealing. (3) We could take a train to a bigger town and then look for an overnight train from there. Marseille is so small that it doesn't have many incoming/outgoing trains so our options seemed limited as long as we stayed there. 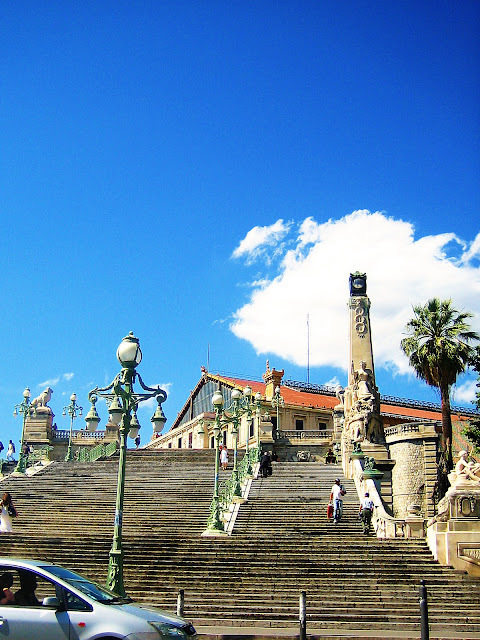 Deciding that the third option was our best option, we hopped aboard the next train to Avignon, France, without realizing that this location offered just as few options as Marseille. There was, however, one overnight train leaving at midnight, which would take us to Strasbourg, France (the border of Germany and France). We waited for what felt like an eternity in Avignon, although I think it reality it was just under 5 hours. In my memory, though, our time there stretched on for days. We sat on the benches of the train platform, sore, tired, weary, and hot. You know that sunburned feeling where you're just radiating heat from the inside out? Yeah, that is how we felt. On top of that, there was still a chance we would not be able to board the train; we had to make sure there were still reservations available and the one employee manning the desk inside spoke absolutely zero English or German (and neither of us speak French). We eventually stopped a German-speaking employee who happened to be stepping of a train and walking through the station. She told me we would just have to wait and buy our reservation on the the train, and even that was contingent on whether they had any to sell. Thus, we waited there in Avignon for the midnight train, not even knowing if we would have a place on it. Thankfully, they did! And we didn't even have to buy them. We think the conductor felt sorry for the two young, seemingly helpless, sunburned, panic-stricken American girls. He let us choose whichever seats we wanted, no reservation necessary. We found 2 seats together, reclined them, and fell fast asleep, giddy with appreciation. And when we awoke, we were in Strasbourg. What to do when the Tube workers strike in London....and you have a flight to catch. 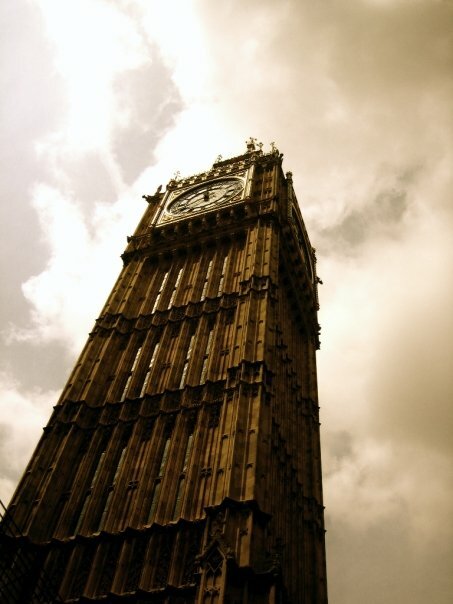 Jenny had a lot she wanted to see and do in London. 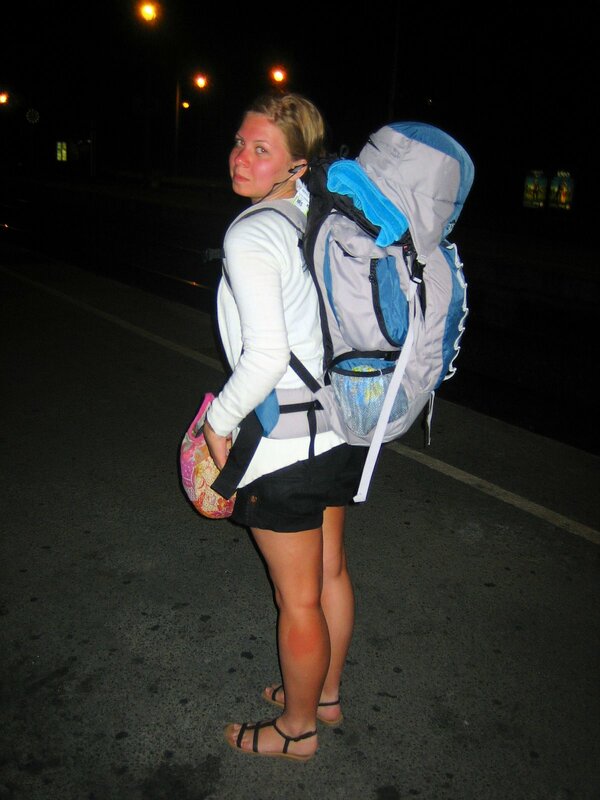 And understandably, too, as this was her first trip to Europe! For our last day, we had written up an itinerary and were so excited about crossing off all the "sights" on our list. We were planning on having the most fun day in London yet. We checked out of our hostel at 8:00 that morning with exactly 12 hours to spare before our flight to France. We planned on checking our bags at King's Cross and then spending the day seeing the sights, as casual as you can be when you have a flight to catch later that evening. Just a fun and fancy-free sort of day, you know? And I'm sure our day would have been so fun and so free of fancy had the Tube workers not decided to strike that morning. Because when the Tube workers strike, it sends London into a state of complete chaos. 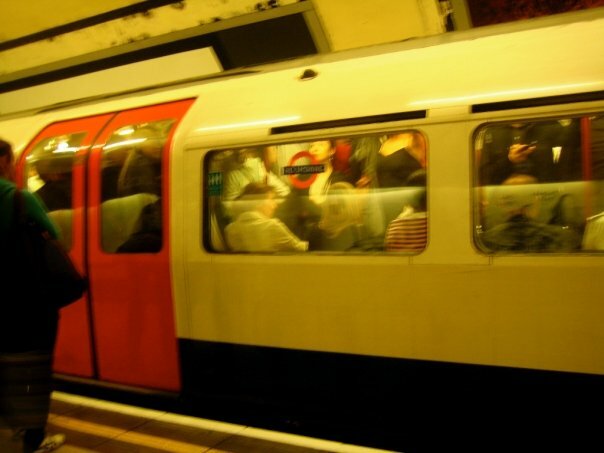 The following picture shows the Tube right after the strike was announced, and all of London, basically, had one hour to make it home before the entire underground system shut down. Jenny and I truthfully felt as though it was the end of the world -- or at least that an apocalypse-themed movie was being filmed in the streets of London. It was like all hell had broken loose in the streets of Londontown. People were pushing others out of the way to get onto the Tube, yelling, cursing, etc. We ended up taking a bus to King's Cross, and the journey should have taken less than half an hour. That day, it took over 90 minutes, and we were crammed in the bus like sardines. Every bus that passed us seemed just as bad, too; completely hectic and packed to the brim. Thus, our day full of fun was suddenly condensed to just one item: Romeo & Juliet at Shakespeare's Globe Theater. 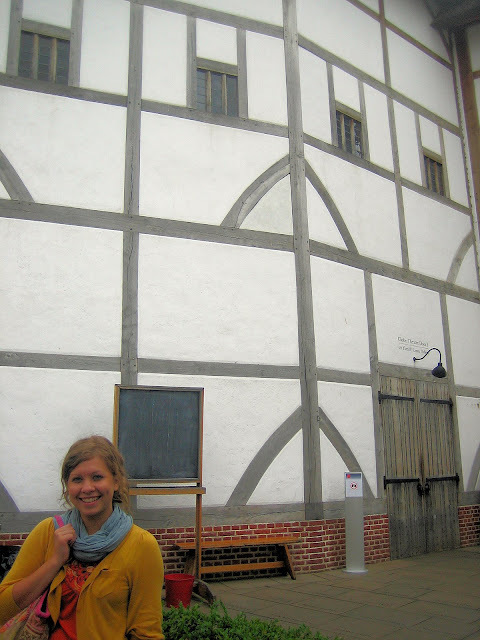 Jenny, standing in front of the Globe Theater, had organized this whole excursion. The Globe Theater is where Shakespeare's plays were originally performed. We weren't allowed to take any photos inside, but when we walked into the open-air theater, I gasped at how cool it was. It looks just like how you would imagine it "back then." We had tickets for "peasant seating" (standing room only, but right in front of the stage) and really enjoyed the view. We had to leave the play early, though, in order to make it back to King's Cross and then take a coach to the airport. Unfortunately for us, the streets of London had only gotten crazier. We still had a full 3 hours until we needed to be at the airport, but the prospect of arriving on time was already looking grave. We caught a bus to King's Cross to retrieve our luggage, but after sitting on the bus for half an hour and only having moved half an inch, we decided to make use of the original public transportation: our feet. 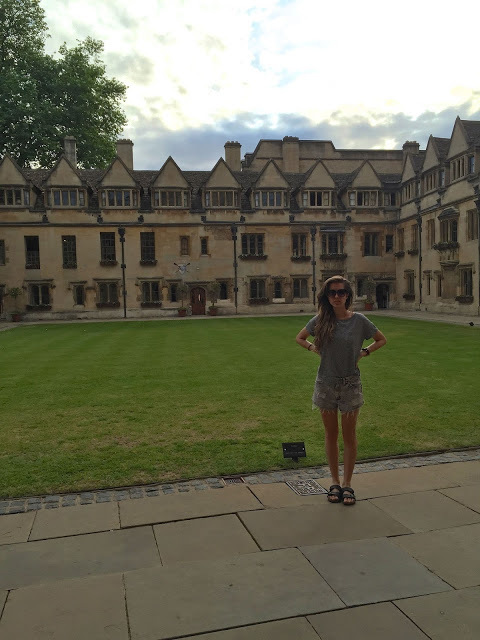 With the help of a single map, we walked/ran to King's Cross....which was pretty far! 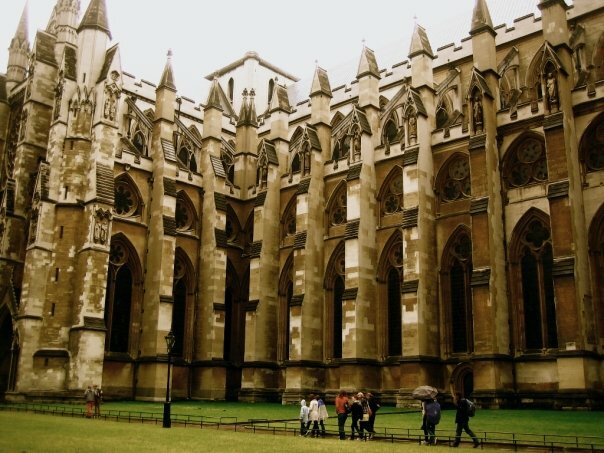 By the time we retrieved our luggage, we realized that, judging by the traffic and chaos we had just witnessed, there was no possible way we could make it all the way to Gatwick in 2 hours; the busses just weren't moving fast enough and we had to catch 2 different busses to make it Gatwick. 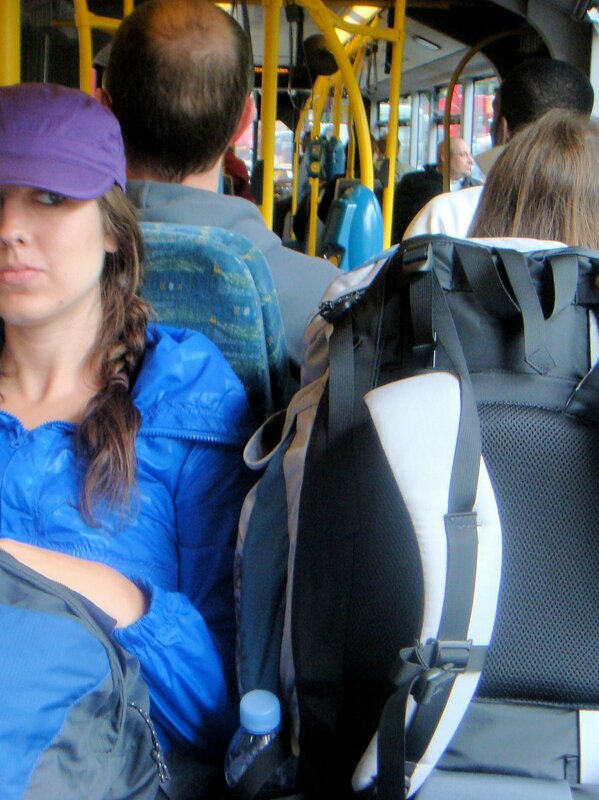 Plus, the busses were so ridiculously crowded that we didn't receive many welcoming looking when we stepped on with our giant, oversized backpacks. Thus, to prevent missing our flight, we paid an extra 8GBP and settled for the Gatwick Express (train), which allowed us to catch our plane with plenty of time to spare. 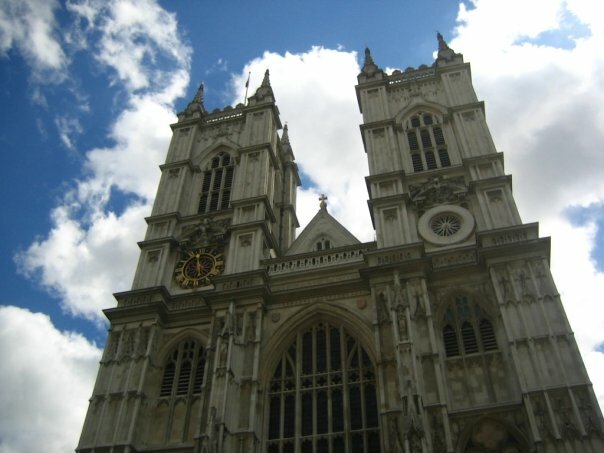 I love London, but I was happy to leave it on this day. Tube strikes and crowded busses do not 'the most fun day in London' make. Until next time, London! And there better not be any strikes going on when I return, okay?? 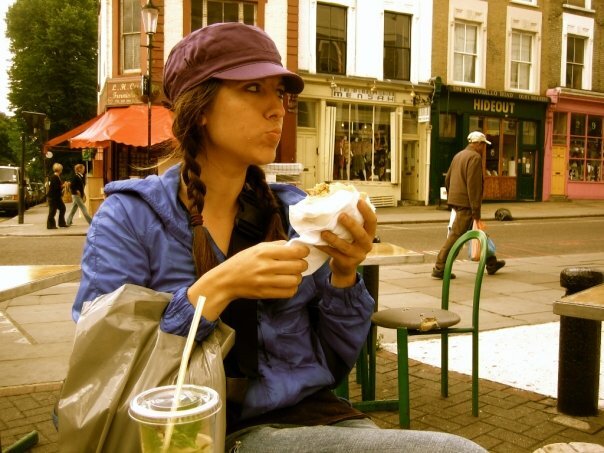 When Jenny decided to come to London, I knew 2 things: (1) I had to take her to Notting Hill (Portabello Market) and (2) while in Notting Hill, I had to take her to Falafel King. 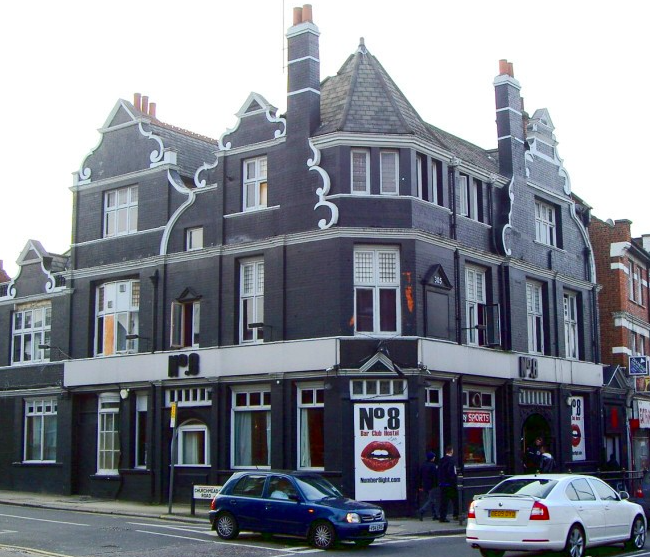 I first visited Notting Hill during the summer of 2008, but it wasn't until my second trip there, in February 2009, that I first experienced the magic of Falafel King. I was there with my friend Sandy, and as we ate, she said to me, "I'm sorry but I'm going to need you to stop talking so I can just think about this falafel and how good it is." I knew exactly what she meant, too. It's just that good. 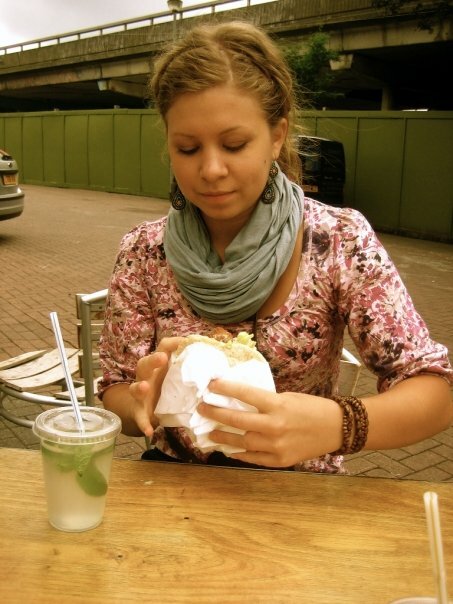 If you go to Falafel King, you must get the falafel pita with the fresh mint lemonade. It is so, so, so, so, so, so good. And if you're wondering who else is tied for "best falafel in Europe", it's obviously Lenny Kravitz's favorite: LA's du Falafel in Paris. 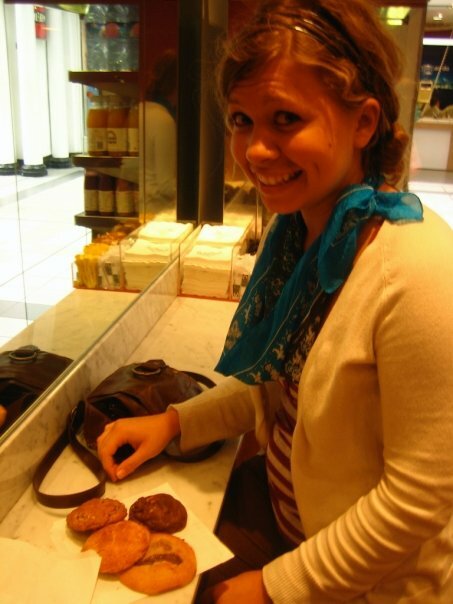 Jenny had budgeted her trip very wisely and to-the-pound (/euro). And I pretty much never have any money, so budgeting is super easy for me since, well, there's nothing to even budget. For example, when Jenny arrived in London, she came bearing gifts (from my mom). My mom had sent with her a Ziploc bag of GBP and Euro coins since those cannot be exchanged. You would have thought I had won the lottery when Jenny handed me that bag. "I can eat today! ", was the first thing that came to mind. So it should come as a surprise that both of us, along with Lindsay -- who was in an even stickier financial situation than I since her debit card had just been 'eaten' -- decided to go see Les Mis one night at Queen's Theatre for 60 GBP a piece. With what money were you planning on buying that ticket?, you ask. Well, this is the part where I explain to you how resourceful and imaginative I am. I emailed my mom and proposed to her that she buy me the ticket as an early birthday present, and then just remember to not buy me a birthday present later that year. She agreed, and bought me the ticket. And so, we saw Les Mis! And a wonderful time was had by all. It was a great birthday experience, if I do say so myself. P.S. My birthday is in September. The second-best cookies in ALL OF EUROPE. If you've known me for more than five minutes, you know that my sweet tooth rules mostly all of my eating habits. For that reason, I fancy myself quite the cookie expert. Best chocolate chip cookie in the States? BJ's. As in the chain restaurant. As in my taste is just that refined. But their chocolate chip pizookie cookies are so. freaking. good. Best oatmeal raisin cookie in the States? Subway, duh! I know, I know, I should be a gourmet taste-tester. But the thing I've learned since moving to Europe is that it's so very hard to find a good cookie here. Thankfully, that's not the only thing I've learned since moving to Europe. 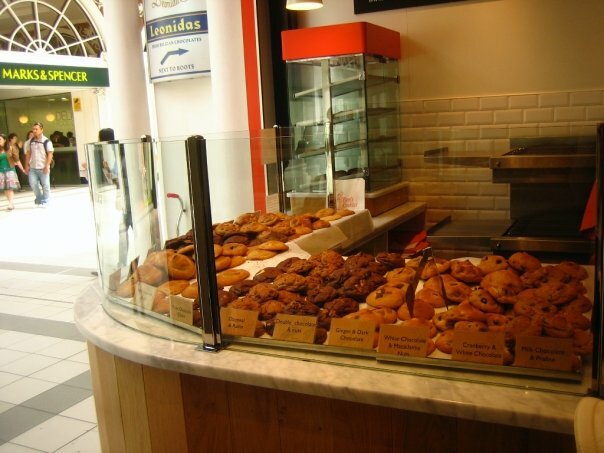 Also thankfully, there are two exceptions to the "Europe doesn't do cookies (or at least doesn't do them well)" rule: (1) Millie's Cookies in the Berlin hauptbahnhof and (2) Ben's Cookies in London (various locations). 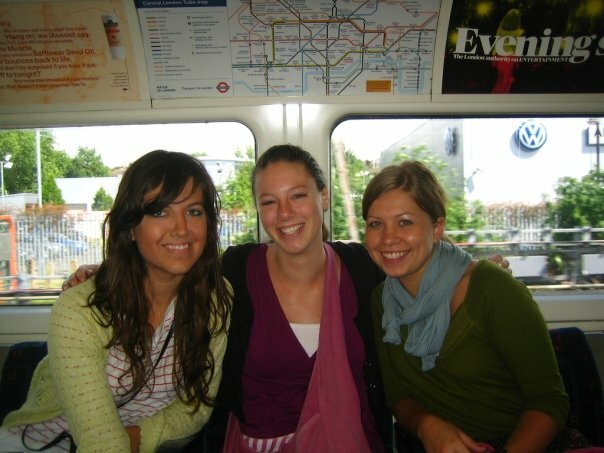 So on Jenny's second day in London, when the 3 of us split up (we all had different things we wanted to do), we arranged to meet at the High Street Kensington tube station a few hours after we parted ways. Jenny and I were waiting there for Lindsay when we decided to stop into Ben's and get "just one cookie each." 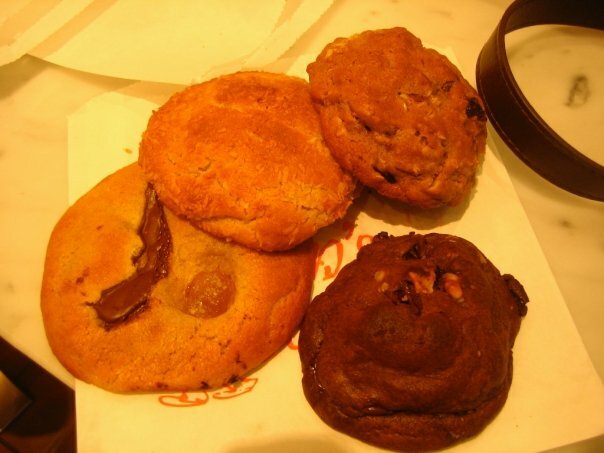 When we arrived at the counter, however, we couldn't decide on just one, so we decided on "just two cookies each." When the woman at the counter said, "Buying five cookies is actually cheaper than buying four", Jenny decided she'd get another. And when the woman at the counter said, "Well, and if you buy give, you get two free", we ended up with seven cookies between the two of us. I would love to tell you that we waited and saved some for Lindsay, but that was not the case. Sorry, Lindsay. 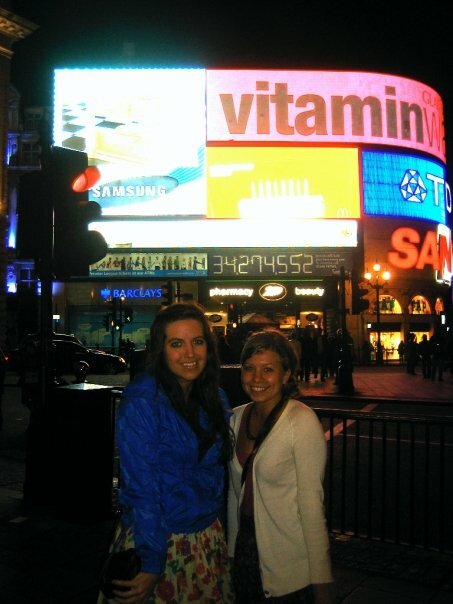 Next time we're in London, I promise I'll go to Ben's and get cookies with you...just for your sake. Not at all for mine. 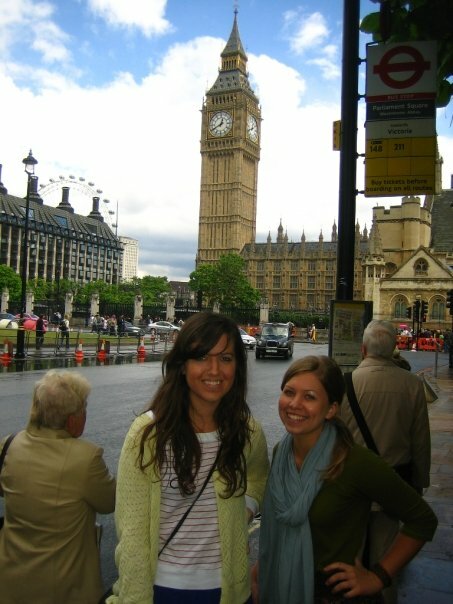 Before Lindsay and I knew it, it was June 6, which meant it was time to fly to London to meet Jenny Clem; a very good friend of mine from Oklahoma who came to visit me for 3 weeks! 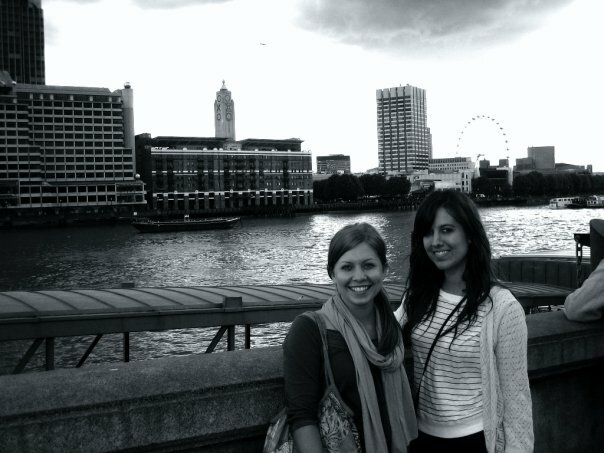 We flew out of Salzburg straight to London Stansted and then took the National Express to the tube before heading to our hostel, where Jenny was planning on meeting us. It was impossible to determine exactly what time we would arrive in coordination with what time Jenny would arrive; she wasn't able to use her phone due to roaming charges and Lindsay's and my A1 phones weren't exactly 'smartphones' capable of doing anything more than SMSing, calling (Austria numbers), and calculating how much we were spending on Happy Hippos and Studentenfutter while grocery shopping at Merkur. In other words, it was a big, fat shot in the dark as to when and where we would meet up with Jenny. She knew the address of the hostel, but that's about it. As I'm typing this, I'm wondering why on earth I didn't just meet her at the airport, knowing she'd never been to Europe before?? Am I a terrible hostess?? 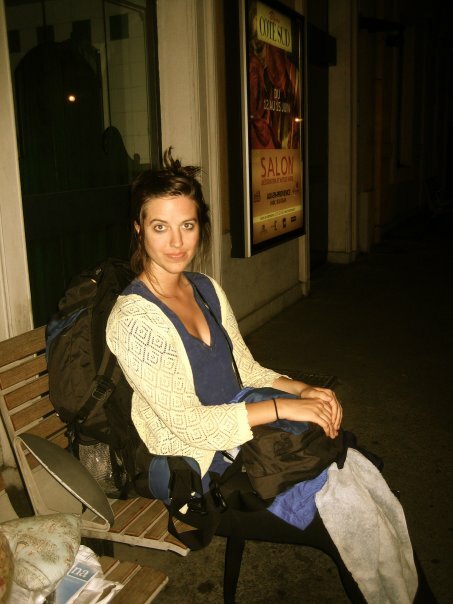 Regardless, shortly after Lindsay and I found and checked into the hostel, I decided to walk outside on the off-chance that Jenny would be wandering around the street looking for the hostel. AMAZINGLY, as soon as I opened the front door to the hostel, there she was! I didn't realize how excited I was to see her until that very moment -- I hadn't seen her in 5 months! 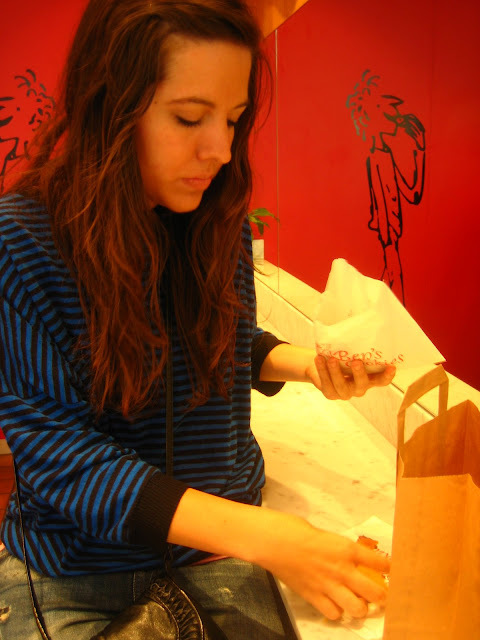 We quickly unpacked at our hostel, grabbed a bite to eat, and then set off to see the sights. 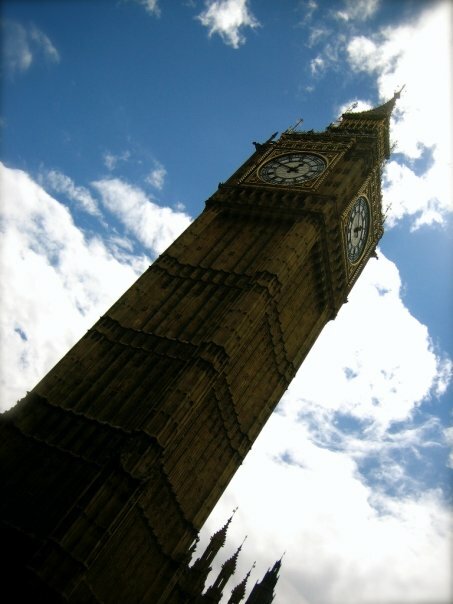 This being my 4th trip to London in a year, I felt no need to bring a camera, which I later regretted. Thus, all these photos are Jenny's (thanks, Jenny!). After our first day "seeing the sights", we retreated back to the hostel. Now, the No. 8 Hostel has strangely good reviews on Hostelworld, but our experience there was NOT 4 out of 5 stars. It was maybe 2.5? One star for the price, one star because nothing got stolen and no one tried to kill us, and half a star because it wasn't (to our knowledge) infested with rats, roaches, or rodents of unusual size (and that always deserves at least half a star, you know?). Anyhow, the location is inconvenient at best, and the rooms are....not the kind of rooms you're going to want hang around in longer than necessary. Basically, when you wake up, the atmosphere is such that you will want to leave as soon as possible (which, hey!, is conducive to getting you out of bed to go sight-see!). But the location and room set-up pale in comparison to....the bathrooms. Don't get me started on the bathrooms. I showered once and that was one time too many. The only thing the No. 8 Hostel has going for it is the price (which, as you can imagine, is the only reason we stayed there). I am fairly certain I will never stay there again and by that I mean I sincerely hope I never have to stay there again.